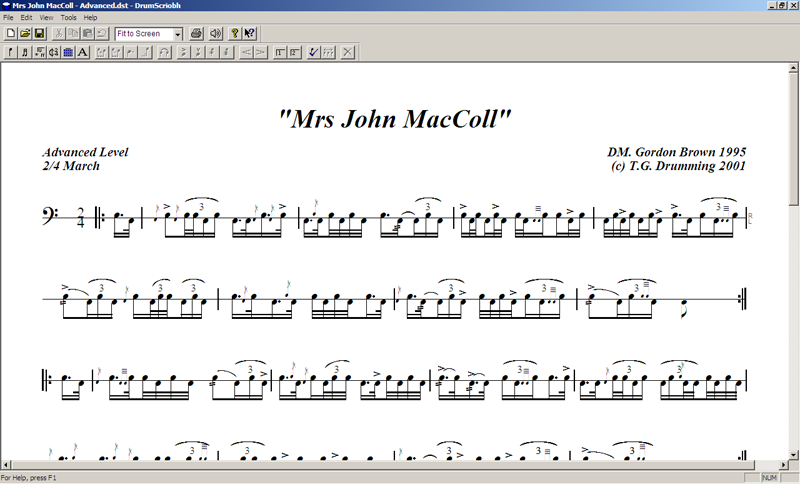 DrumScriobh 2, pronounced "DRUMSCREEV", Scriobh in Gaelic is "to write" is a drum score writing application, with wave sound playback, for Windows. The composer initially defines the score characteristics when a new score is created from the File menu. Next the music structure is defined with a simple user interface. i.e. Time signature, How many lines This is very similar to the PiobMaster structure dialog. 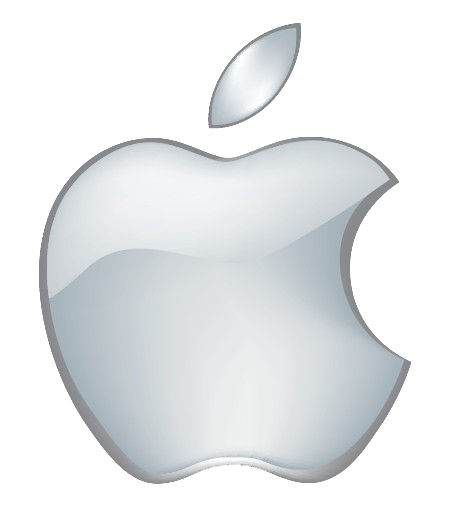 In addition, there are a number of toolbars which may be used to drag and drop structure items, clefs, time signatures etc. directly on to the score. Like PiobMaster, the user then has the ability to drag and drop, notes, rests and embellishments from their palettes onto the lines. Notes can be "Grouped, "Tied" etc. by simply selecting them and pressing the appropriate button. In addition, any part of the score can be annotated using the text tool. Samples sound output is now available in DrumScriobh 2. It will be controlled from the sound toolbar. One of a number of different sound sample "sets" can be selected via the Options screen. 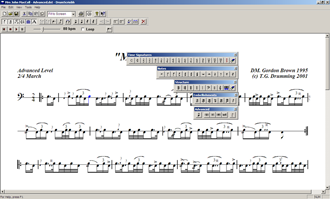 The user can even create their own samples which will be picked up by DrumScriobh 2. Full details available in the integrated online help facility. 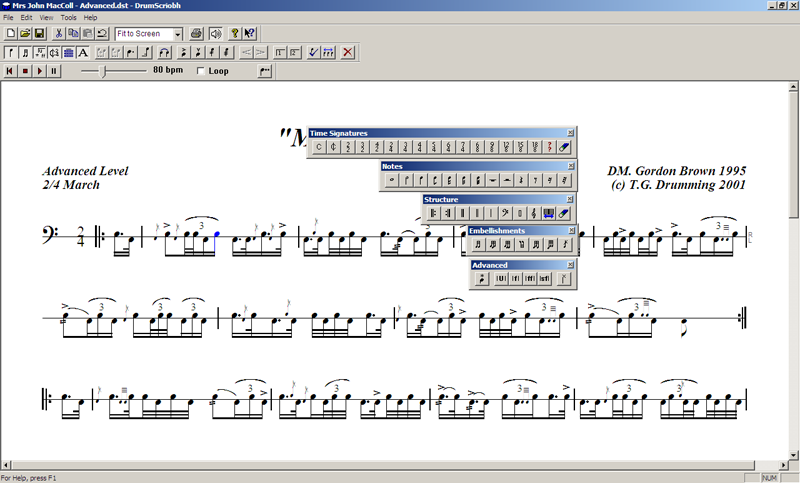 World Champion Lead Drummer, Gordon Brown assisted with the fine tuning of the software. To Upgrade from any previous version of DrumScriobh, download the latest software and purchase a new license key). If deciding to purchase the CDROM version, please note that the CDROM has to be in the drive when initiating the software. 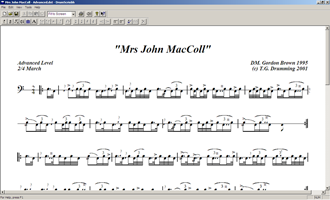 Allows you to view and print scores produced with DrumScriobh.